Best things to eat while in Myrtle Beach. Thank you Myrtle Beach for having me as a guest to enjoy your wonderful city. All opinions are my own. Myrtle Beach is known for its gorgeous beaches but it is also known for some of the best food one can find! Here is a list of what to eat while you are enjoying your stay at Myrtle Beach. Everything on this list is a restaurant that I would consider family friendly and also qualify for the perfect place for a romantic date. 1. She Crab Soup. We had never heard of She Crab Soup before going to Myrtle Beach and it has to be one of our favorite discoveries. It is a cream based soup that is so buttery and amazing! I would liken it to clam chowder, but waaaay better. My husband ordered it from a few different places, his favorite was from Flying Fish. 2. Hush Puppies. 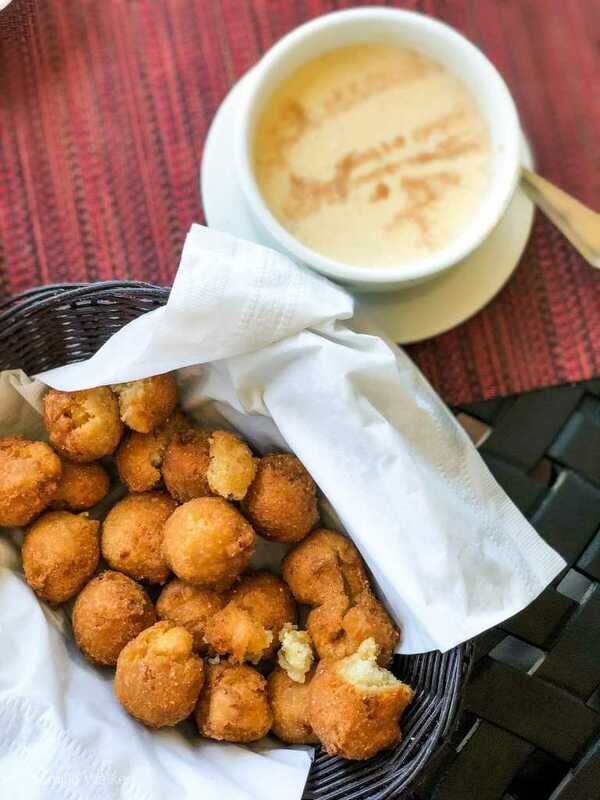 Hush puppies to me are a mix between corn bread and a donut. They are deep fried pieces of heaven, be careful not to eat too many before your main course arrives because they are quite filling! Our favorite find was at Sea Captains. 3. Cheese Grit Paddy. This was something I didn’t order, but it came as a surprise when the potato cakes were all out. I was actually glad this came as a side because I am typically not a big fan of grits. They have to be cooked well for me to really like them and these were! You can find this dish at Wicked Tuna. 4. 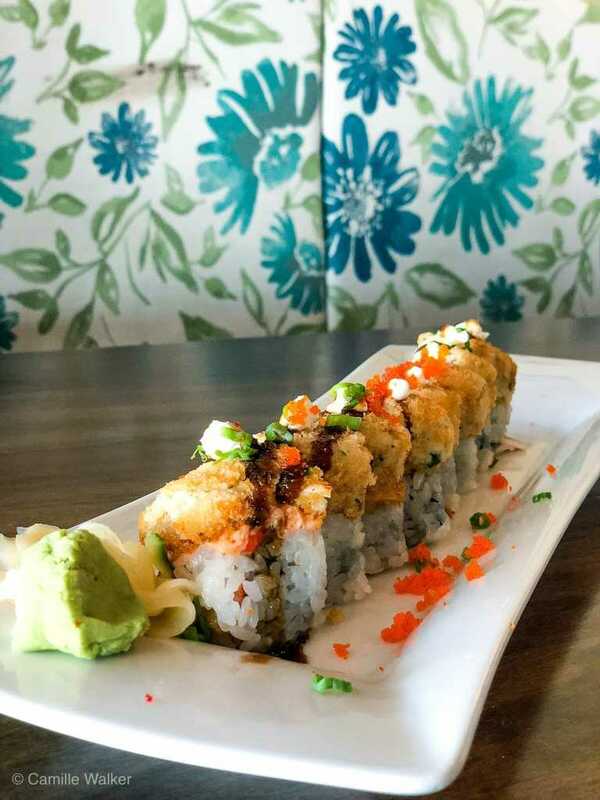 Merlin’s sushi roll from Wicked Tuna. My husband is a HUGE sushi fan and he said this was on the best rolls he’s ever had because it had crab cake on top of spicy tuna. Again, I am typically not a huge sushi fan and I really liked this, too. 5. Ice Cream from Mad Myrtles Ice Creamery. I am a big fan of mixing hot and cold when it comes to food and experiences. Ice cream on a hot night while walking in a cool ocean? Yes, please! I tried the Butter Pecan and Extreme Moose Tracks, both were very good! You can also get a shake if that suits your fancy. 6. Churro pancakes from Johnny D’s. Yes, this waffle house happens to be known for is waffles, but if you’re a fan of churros and all things brown sugar this happy breakfast will not disappoint. Topped with fresh strawberries and a powder sugar based glaze you will be dreaming about this dish for many mornings! 7. Salmon Chef salad from Sea Captains. This was my favorite dish of the trip. I don’t know if it was because I was feeling heavy from eating hush puppies and churro French toast, but this finely chopped salad had me singing all the way home. You can top this salad with chicken, shrimp, or salmon but trust me when I say the salmon is amazing!The salad is topped with mushrooms, carrot shreds, almond slivers, bacon bits, cheese, and hard boiled egg. I would suggest trying it with the ginger soy dressing, but the house dressing it delicious too. You can find Sea Captains right on Ocean Boulevard, just make sure to park across the street unless you will be needing the handicapped parking which is available right in front of the restaurant. 8. Grilled Halibut from Flying Fish. Flying Fish is a gorgeous restaurant. I love the art on the walls and the ambiance of the restaurant. It is casual, has bar seating available, but could easily be considered a fancy date if you make it that way. This restaurant is also very family friendly, it works for everyone. You can choose catch of the day, how you want it prepped, and the sauces used in the preparation of your dish. I love the customization options available and was so happy with my choice. Halibut, grilled, with butter and seasonings. 9. White Corn Guacamole from Wicked Tuna. I am something of a guacamole snob. I know my guacamole! This guacamole has just enough texture to give you a crunch with the perfect balance of creamy delicious avocado. Give it a try, I promise it will not disappoint. 10. Shrimp Stir Fry from Sea Captains. This dish is unexpected and typically something you may not expect. Asian influence with a southern twist? I love it when the best of cultures collide. 11. Hogfish Snapper from Wicked Tuna. Hogfish is found a plenty around the inlet of Wicked Tuna. The Wicked Tuna is a hook to plate restaurant and fresh fish is brought in to be cooked every single day. Hogfish is a bit softer than halibut, but is a white fish that isn’t fishy tasting at all. I was skeptical because the name itself doesn’t sound particularly appetizing, but I am so glad I gave it a try! Try this with a cheesy grit cake and he flavors come together beautifully. 12. Crab dip from Flying Fish. Who knew saltine crackers could be elevated to such a lofty delectable place? This dip is amazing and served as an appetizer to every person that comes into the Wild Fish. It is that good! 13. Magnolias If you’re looking for a fancier fare and a quiet meal for two this is a perfect place to enjoy a little romance and the best of southern comfort food. 14. Turkey Bacon sandwich with fries from Brookgreen Gardens. I was so impressed with the foliage, flowers, and wildlife at Brookgreen. I was pleasantly surprised that their local cafe was amazing as well! This sandwich comes with a sweet honey mustard and finely chopped apples that take this sandwich from ordinary to extraordinary. And I will say, some of the best crinkle fries I have ever had. 15. Waffles with Fried Chicken from Johnny D’s. Looking for the best of breakfast comfort food? Voted best waffles in South Carolina by Food Network, Chicken and waffles never disappoint. There are so many amazing waffle options, so if fried chicken isn’t your thing you can try the banana caramel, waffles sundae, or eggs benedict. 16. Hummingbird Cupcakes from Hopsewee Plantation. A sweet surprise with a similar taste to banana bread topped with a frosting that perfectly compliments the flavor of the cupcake. 18. Tiramisu from Wicked Tuna. This was my husband’s favorite dessert we had while on our trip. 19. Eggs Benedict from Johnny D’s. A classic breakfast delight that is not easily forgotten at famous Johnny D’s restaurant. If you are going for a true southern experience you can order this with grits. A local favorite way of eating them is with bacon or tabasco sauce! 20. Caroline’s Galaxy from The Wicked Tuna. This is something you will only find about in the restaurant if you are visiting now until the end of October 2018, but if you can make it, please try this special peanut butter and chocolate layered moose cake. The taste will delight any peanut butter chocolate fan, and for every dessert sold The Wicked Tuna will donate $2 to the Make a Wish Foundation to help other special children make and fulfill their own wishes. Caroline was one such special girl who’s wish it was to cook with the incredible chef at The Wicked Tuna and they created this dessert together. Looking for more things to do at Myrtle Beach? Make sure not to miss my list of what to do, or my favorite things we saw while we were there!